Laugh along with Robin Duke and the rest of the "Women Fully Clothed"
1. The delightful dames of Women Fully Clothed—Robin Duke, Jayne Eastwood, Kathryn Greenwood and Teresa Pavlinek—bring their humorous yet affecting stories to cottage country. See their latest show, Older and Hotter, on June 10 at the Gravenhurst Opera House. Muskoka offers a rich cultural experience involving theatres, parks and galleries. Don’t miss these artistic experiences! Learn a thing or two about early cottage life, boat-building heritage and pioneer settlers at the quaint, local Muskoka Lakes Museum. Enjoy an evening of family entertainment as the Algonquin Theatre comes alive with the Wonderful Sounds of Music, a rousing performance by the Muskoka Dance Academy. Don’t miss a chance to check out vintage vehicles and win prizes at the 17th annual Antique & Classic Car Show at Gravenhurst’s Gull Lake Park. Take in a revue of emerging local dancers at the Rene M. Caisse Memorial Theatre. As the venue promises, the name may be difficult to pronounce but the shows are easy to love! 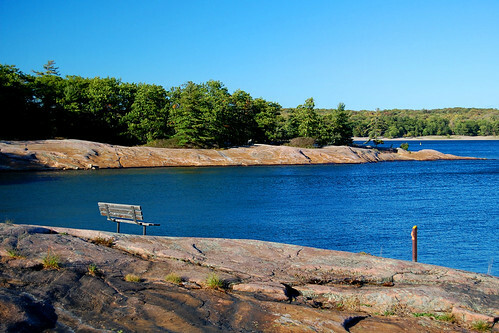 Swim, sail or scuba dive your way around Killbear Provincial Park—in the midst of Georgian Bay’s 30,000 islands—or marvel at the splendour of the Canadian Shield while wandering one of the park’s many hiking and biking trails. Discover new art and purchase cards or gifts at Bracebridge’s Alexandra Luke Gallery, which features the original oil, acrylic and watercolour paintings of Wendy Moses.